One of China’s most provocative living artists, Ai Weiwei (b. Beijing, 1957) has spent nearly four decades exploring the relationships between art, society, and individual experience. His work, as prolific as it is eclectic, encompasses a wide range of media, including sculpture, installation, photography, film, painting, and architecture. Ai Weiwei has sought to incite change through his art since the late 1970s, and as his work has developed, he has become increasingly committed to his guiding principle of promoting human rights and freedom of expression for all. A collaborative artist project, Ai Weiwei: Trace at Hirshhorn features the East Coast debut of the monumental installation Trace, which portrays individuals from around the world whom the artist and various human rights groups consider to be activists, prisoners of conscience, and advocates of free speech. Each of these 176 portraits comprises thousands of plastic LEGO® bricks, assembled by hand and laid out on the floor. The work foregrounds Ai Weiwei’s own experiences of incarceration, interrogation, and surveillance. In 2011, he was detained by the Chinese government for eighty-one days and then prohibited from traveling abroad until 2015. In 2012, the Hirshhorn opened Ai’s first major US retrospective exhibition, Ai Weiwei: According to What?, which he was unable to attend. Originally commissioned in 2014, Trace first opened as part of @Large: Ai Weiwei on Alcatraz, a site-specific takeover of the former Alcatraz Federal Penitentiary in San Francisco, and a collaboration between the nonprofit FOR-SITE Foundation, the National Park Service, and the Golden Gate Park Conservancy. 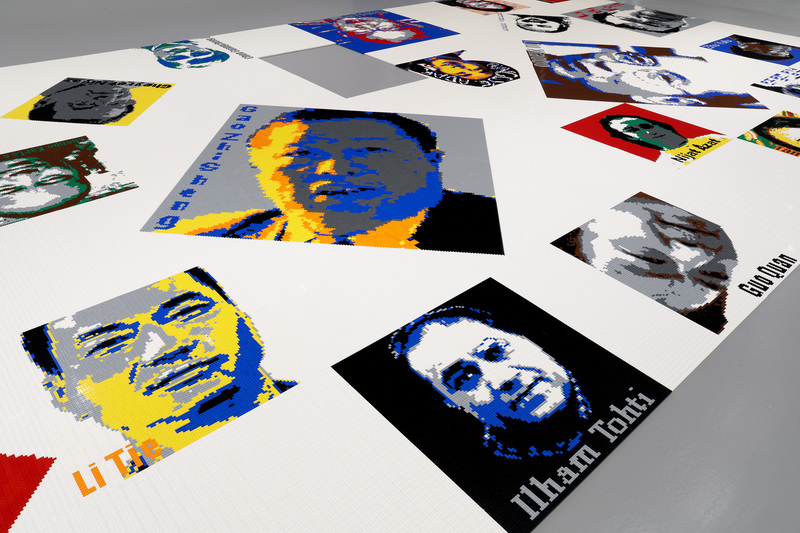 Like Ai Weiwei, the individuals represented in Trace have been detained, exiled, or have sought political asylum because of their actions, beliefs, or affiliations. The subjects were chosen by Ai Weiwei and reflect his response to information provided by Amnesty International and other human rights organizations, as well as his own independent research. Trace includes individuals from more than thirty countries, the majority of whom are from Asia and the Middle East, reflecting Ai’s familiarity with the region. The full list can be found on FOR-SITE’s website. To complement the display of Trace at the Hirshhorn, Ai Weiwei has created a new 360-degree wallpaper installation entitled The Plain Version of the Animal That Looks Like a Llama but Is Really an Alpaca. At first glance, the repeating graphic pattern looks merely decorative, but a closer inspection reveals surveillance cameras, handcuffs, and Twitter bird logos, which allude to Ai Weiwei’s tweets challenging authority. Together, both massive works span nearly 700 linear feet around the Hirshhorn’s second floor Outer Ring galleries. Ai Weiwei joins the Hirshhorn’s 2017–18 recognition of a diverse group of international contemporary artists whose work reflects the intersection of history, politics, and culture—including Japanese artist Yayoi Kusama, German artist Markus Lüpertz, Swiss artist Nicolas Party, and American artists Yoko Ono, Theaster Gates, and Mark Bradford. Why did Ai Weiwei create Trace? 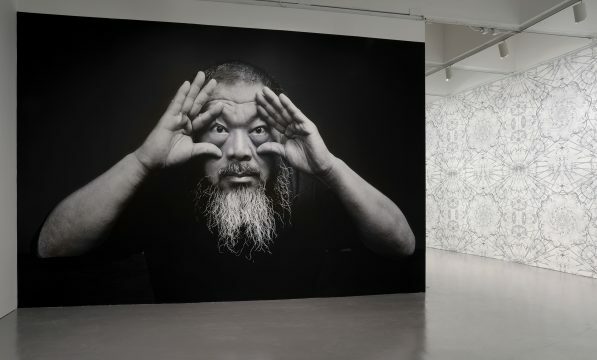 Ai Weiwei’s own experiences of incarceration, interrogation and surveillance form the basis for his interest in the portrayal of dissidents worldwide. He has long been a vocal critic of the Chinese government’s stance on human rights and freedom of speech. In 2011, while already a prominent contemporary artist, Ai Weiwei was arrested and detained in Beijing for 81 days and prohibited from traveling abroad until July 2015. Trace was created in 2014, while he was still unable to leave China. Ai Weiwei continues to be one of most significant voices on the international art scene while producing a prolific array of work. His work continues to inspire conversations about global issues. Visitors’ perspectives of the individuals Ai chose to portray will no doubt vary—some are considered criminals in their own country, others heroes—inspiring conversation on the sometimes cloudy line between activist and lawbreaker. Trace is created using more than 1.2 million LEGOs. 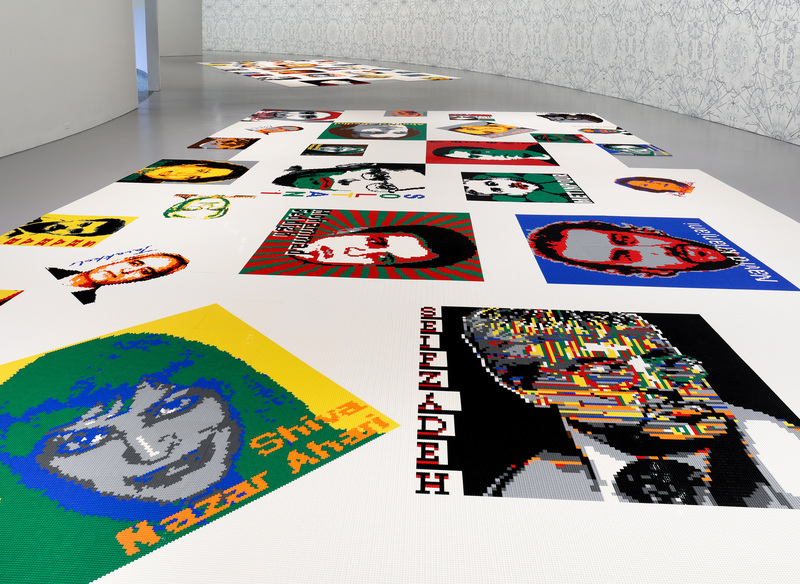 Each individual portrait is comprised of several thousand LEGO bricks, assembled by hand and laid out on the floor. Each portrait is created in panels, which are then connected. Each of the six zones features approximately 396 panels combined to create 30 portraits per zone. 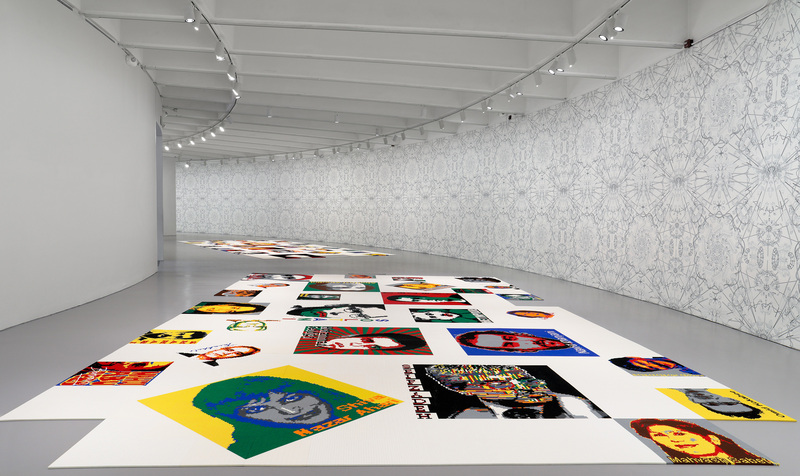 Inspired by his five-year-old son, Ai chose LEGOs as a disarmingly playful and ubiquitous material that can easily be constructed, or deconstructed, on a massive scale—in some ways acting as a metaphor for freedom. Ai is known for appropriating materials in his works such as pearls, porcelain, and salvaged wood, and the artist has a tendency to use mass quantities of objects–and large numbers of volunteers—to help create his work, playing with the dichotomies of individual and collective effort, unity and fragmentation. Why are the portraits pixelated? 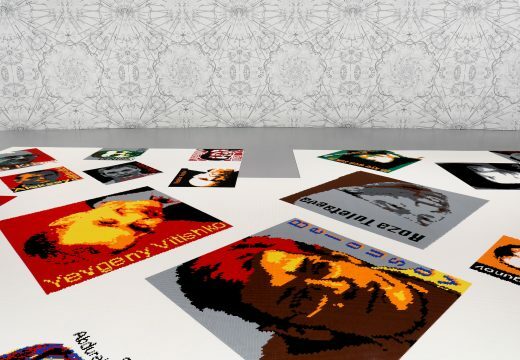 Each image is pixelated, resembling surveillance or photos found on the internet. The graphic manipulation can symbolize the dissolving nature of the individual, or may suggest that each person has been encoded as a form of digital data. The colors in each portrait roughly represent the colors of the subject’s national flags. How is the exhibition arranged? The installation features portraits of 176 individuals from around the world whom the artist believes to have been detained, exiled or have sought political asylum as a result of their actions, beliefs or affiliations. They are arranged on the floor, in six zones spread throughout the Museum’s 700-foot second level gallery space. The work is built entirely of plastic LEGO blocks. Trace will be joined by a new work—a monumental wallpaper installation called The Plain Version of the Animal that Looks Like a Llama but is Really an Alpaca. The intricate graphic is a lavish, rococo print of Twitter birds, surveillance cameras, handcuffs, chains, and alpacas, images of both expression and control. It will span the continuous 700-foot perimeter of the exhibition’s exterior wall. On view near the exhibition entrance will be The Animal that Looks Like a Llama but is Really an Alpaca, a gold graphic wall treatment that uses similar imagery but employs lavish color to create a tromp l’oeil effect. 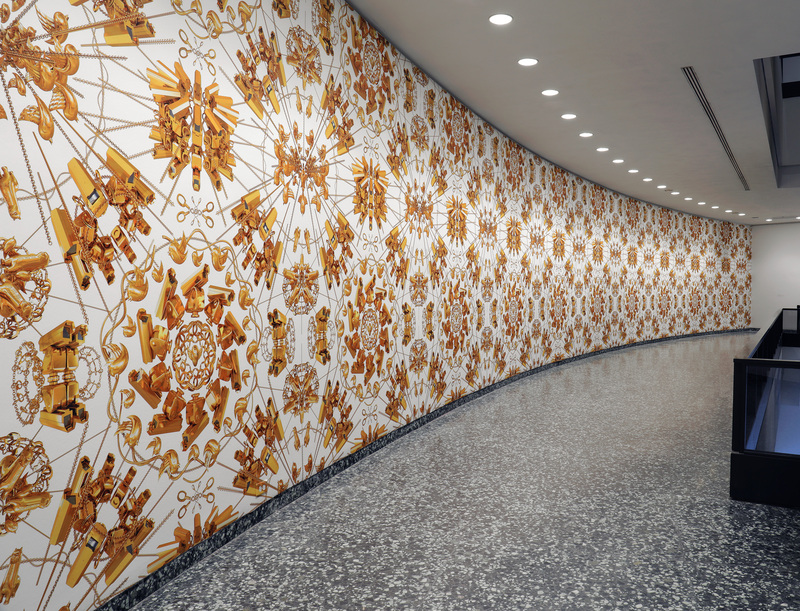 Those who look closely will be rewarded with an image of Ai Weiwei himself hidden within the pattern. Why is the graphic wallpaper called The Plain Version of the Animal that Looks Like a Llama but is Really an Alpaca? The title, and the work itself, has a touch of ironic humor and is a form of wordplay. The “Grass Mud Horse,” or caonima, is a Chinese internet meme that resembles an alpaca and is a popular symbol of defiance against censorship in China. In Mandarin, caonima can also be translated as an insult. The animal’s image has become an internet phenomenon worldwide, frequently appearing in the media and even on merchandise. It is prefaced with The Plan Version to differentiate it from a similarly-titled earlier work, also on view in the exhibition, which features gold and 3-D modeling. LEGO® is a trademark of the LEGO Group, which does not sponsor, authorize, or endorse this program. Ai Weiwei: Trace at Hirshhorn has been made possible through generous support from the Sidney E. Frank Foundation, Peggy and Ralph Burnet, and Ken Grossinger and Micheline Klagsbrun. The Museum received additional funding from the Hirshhorn International Council and the Hirshhorn Collectors’ Council.